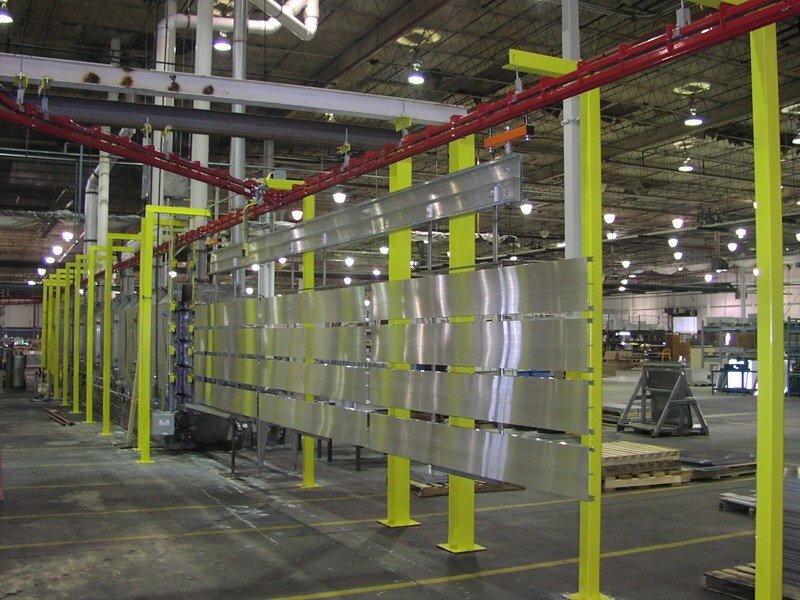 Virtually every paint and finishing operation from wet spray and e-coat to powder coating and plating will involve one or more pre-treatment processes that need to be completed before the final paint or coating can be applied. Finishing pre-treatment or surface preparation typically involves moving the product to be finished through a series of chemical baths and rinses designed to clean the surface and remove greases, soil, oxides and other materials. Phosphating, abrasive blasting and drying are other processes involved in pre-treatment and surface preparation for finishing. 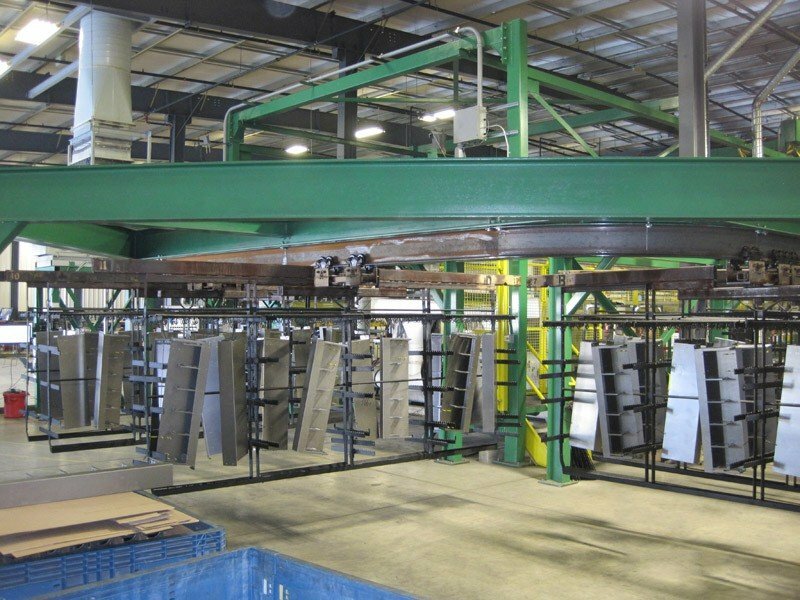 PACLINE has a number of overhead conveyor products that have proven to be excellent solutions for handling products through all stages of finishing pre-treatment and surface preparation. All of our PAC-LINE™ conveyor components (conveyor track, chain and other components) are designed to withstand the harsh chemicals involved in these processes which can include detergents, solvents and caustics that can adversely affect equipment. PACLINE offers several conveyors that feature enclosed tracks that serve to help protect the moving chain from chemicals and debris. Another important consideration when choosing a conveyor for a finishing pre-treatment process is the physical size of the conveyor components and the availability of tight radius track curves that can make installation in small spaces or around other equipment possible. 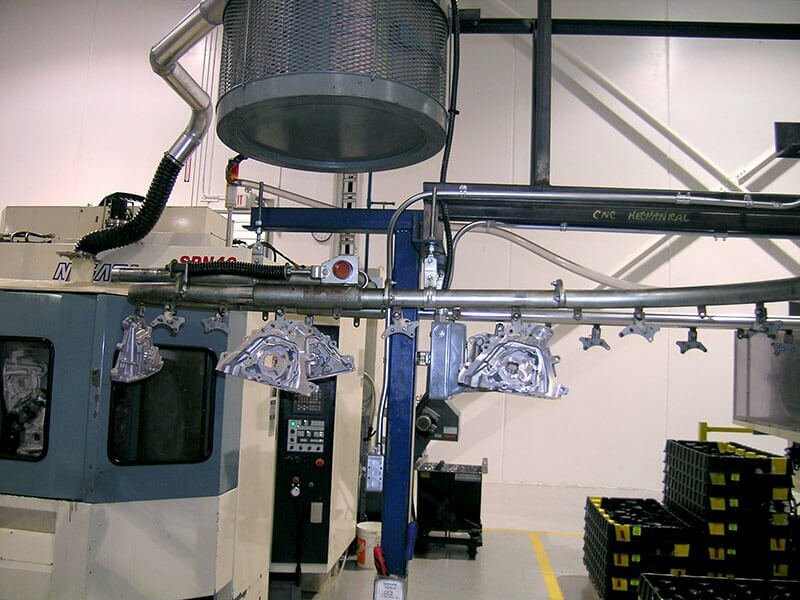 The PAC-LINE™ conveyor provides a compact system to carry machined metal parts through a chemical wash process. This power and free conveyor system is carrying long metal parts through a chemical wash and dry off process before final paint finishing. 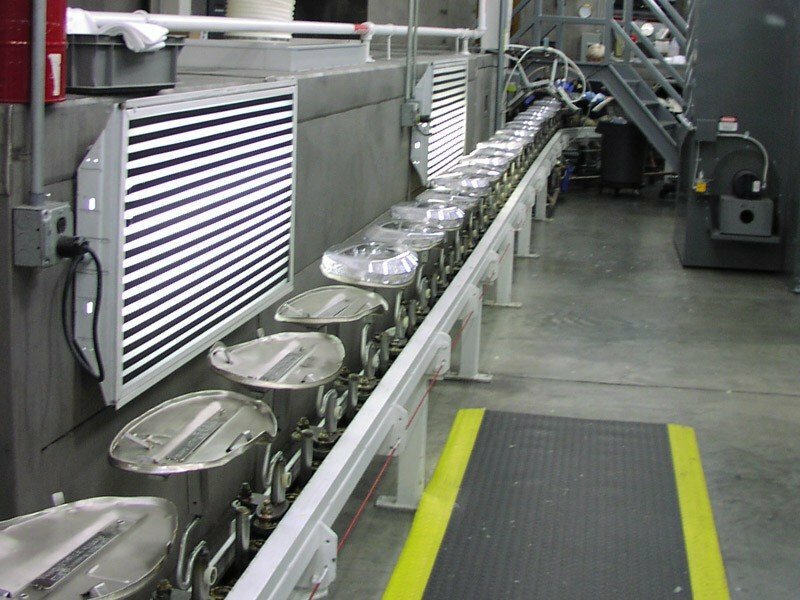 This PAC-MAX™ conveyor is floor-mounted and inverted to carry these metal parts through a chemical wash. The carrier rotates 90° and a “fishscale” shroud covers the track through the washer sections. The PAC-BEAM™ conveyor transports heavy racks with steel parts through a cleaning process.